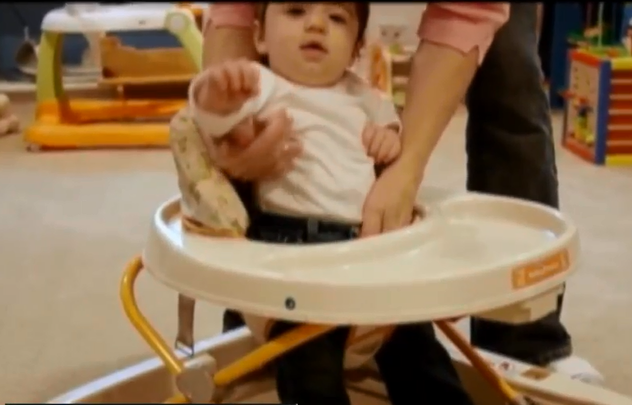 (CNN) -- Changes in safety standards led to a steep drop in the number of babies injured using infant walkers. Still, more than 9,000 US children are injured using the devices every year, according to a study published Monday in the journal Pediatrics. More than 90% of incidents led to head and neck injuries and the most common cause of injury -- 74.1% -- was falling down stairs. Other causes of injury included falling out of the walker, and proximity-related injuries such as a child pulling or touching an object that they were able to reach when in the device. The American Academy of Pediatrics (AAP) has called for a ban on baby walkers with wheels . It suggests parents throw away walkers in their homes and entertain their children in stationary activity centers and other activities. The devices have no developmental advantages, and create a risk for children, according to the AAP. Other countries, such as Canada, have a complete ban on the sale and manufacture of baby walkers. 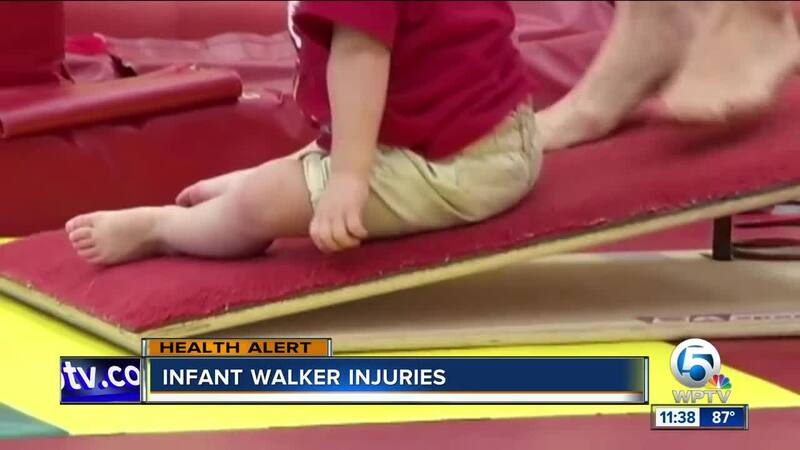 One of the authors of the study, Dr. Gary Smith, said he's had an interest in baby walker-related injuries since he began his medical training 30 years ago. As an emergency and pediatric physician, he has treated babies who were injured while using walkers. The paper states that in 1997, certain voluntary safety standards were put in place, such as a requirement that "infant walker frames be wider that a standard 36-in doorway or have a braking device if one or more wheels drop over the edge of a step." In 2010, the US Consumer Product Safety Commission made these standards mandatory and more stringent. "What we set out to do was give a nice summary of what's happened over the last 25 years to this source of injury to young kids, and specifically to look at the effect of the 2010 change that converted the safety standards of walkers from a voluntary standard to a mandatory standard," said Smith, the director of the Center for Injury Research and Policy at Nationwide Children's Hospital in Columbus, Ohio. Data from the National Electronic Injury Surveillance System was used to calculate the number of children injured while using a walker over 24 years. In the four-year period after the safety standards became mandatory, walker-related injuries decreased by 22.7% compared with the four years before, when the standards were voluntary. Although injuries from falls decreased, the study found that other causes of injury increased slightly (2.3%). Smith and his co-authors say the change is partly due to the change in safety standards, but they can't solely attribute it to that. Other factors, such as the number of walkers present in homes and the slow disappearance of older, more hazardous walkers could also be contributing factors. "I think people think they are cute and fun," she said, "and theoretically anything you can do to put your kid in something to keep them occupied while you're trying to get things done is a great thing," said Fischman. Despite improvements since standards became mandatory, Smith and his co-authors continue to see roughly 2,000 children a year treated in emergency rooms, often for serious injuries such as skull fractures. They support the AAP's position on infant-walkers. "Despite the successes we have seen," Smith said, "these are still a source of serious injury to children that's preventable, and therefore they should not be on the market." Like Smith and the AAP, Fischman believes that devices that don't give young children the range of movement a walker does are safer alternatives. "Why do we not like them? It's because these kids aren't able to move around on their own yet," she said, "they don't have the judgement to say, 'Oh I shouldn't be getting into that, I shouldn't get close to the stairs.'"